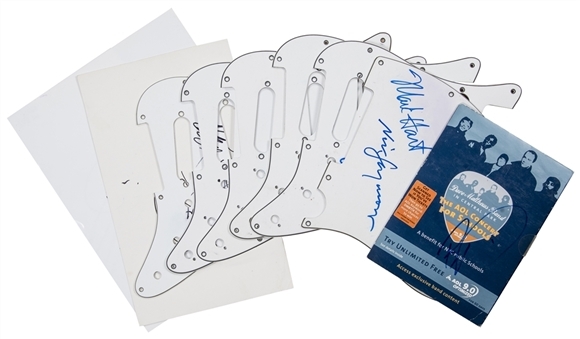 Offered here is a collection of eight musicians signed items, including six signed pick guards. The first item is a CD cover from a free trial of AOL 9.0 signed by Boyd Tinsley of the Dave Matthews Band. The second item is a 7 x 11-inch piece of paper signed by Jacoby Shaddix of Papa Roach in black marker. The remaining six items are white pick guards. The first has been signed by Mike Hart and Nick Seymour of Crowded House in blue marker. The second pick guard has been signed in blue marker by Evan Dando of The Lemonheads. The third pick guard has been signed in blue marker by Ian Brown. The fourth pick guard has been signed in black and blue marker by three members of the Donna’s. The fifth has been signed Tom Morello of Rage Against the Machine in blue marker. Finally, the sixth pick guard has been signed by two members of Supergrass. Each item in this lot comes with a COA from JSA (AA82306 through AA82313).